From the first day of trading in 2018 to the last, that was the final percentage difference in Tesla’s share price. Taken on its own, the number is a modest and positive gain — and far more fruitful than automakers Ford, GM and Fiat Chrysler. It’s a number that suggests a consistent year of upwards momentum for Tesla, steady and diligent like a tugboat, even keeled and untouched from stormy market seas. Those two bookends of the stock market calendar — January 2 and December 31 — and the 3.8% gain they produced obfuscates what really happened to Tesla and CEO Elon Musk in 2018. It wasn’t quiet. It wasn’t calm. It wasn’t constant or consistent. Tesla wasn’t a tugboat in 2018; it was a whipsaw. The year was a dizzying ride that took Tesla shareholders and fans, critics, car owners, and employees, the media and Musk himself to extreme highs and troubling lows — sometimes flip-flopping twice or more in a few days time. And it was exhausting because so much of it seemed self-inflicted and avoidable. The chart illustrates the ups and downs of Tesla’s share price along with specific highlights. But there were so many more. As Tesla floundered early in the year, hamstrung by production hell of its Model 3, Musk’s company SpaceX made history when it completed a test of its Falcon Heavy rocket, the heavy-lift orbital vehicle that can carry twice the weight of its closest competition in active operation. It turns out those jokes weren’t so far off. Tesla was burning through millions of dollars a day as the company tried to solve production bottlenecks in its factory. “Tesla really faced a severe threat of death due to the Model 3 production ramp,” Musk said in an interview with Axios in November. The company was within “single-digit weeks” of dying, he added. Other problems emerged as Musk and his employees scrambled to solve that very real and impending existential threat to Tesla. There was the unfortunate unhinged analyst call and a spat with the National Transportation Safety Board over a fatal crash and investigation into the automaker’s semi-autonomous Autopilot system. And then it happened. Tesla, which appeared to be in a death spiral, produced 5,000 vehicles in a week. It was a triumph. The naysayers were proven wrong; the critics were silenced; the shorts would convert! And it was only July 1. The rest of the year played out much the same way the first half did, just with a few new characters and twists from the “pedo guy” episode that played out on Twitter and Musk’s “funding secured” tweet to pot-smoking, SEC investigations, and earning its first profit in two years. The last quarter of the year was marked by advancements in its Autopilot system, lawsuits and subpoenas, a new Tesla chairman, two new board members Larry Ellison and Kathleen Wilson-Thompson, and further expansion into China. 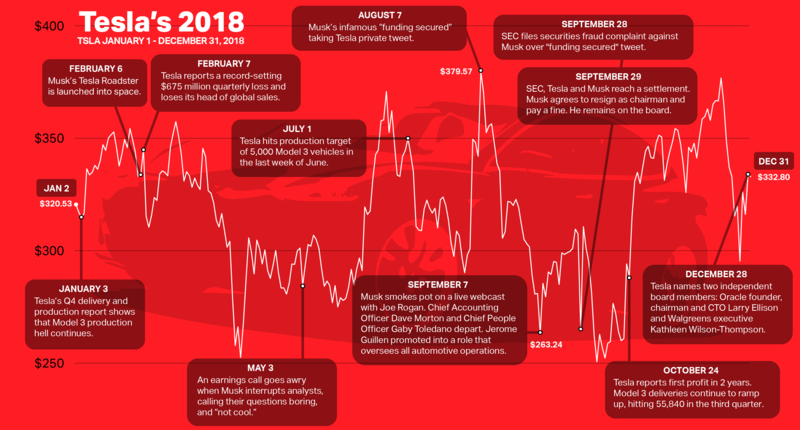 Tesla’s rollercoaster ride of a year was stomach churning — or thrilling, depending on your point of view — without Musk engaging in Twitter. But his frequent use of the social media tool repeatedly pulled the company, or himself, back into an abyss of petty fights, distractions and at its worst, potential derailments to a company he has invested so much of his time, money and emotion in. In 2019, with the Model 3 moving into new regions of the world and hints of other grander plans, Tesla deserves, and will need, a captain with both hands on the wheel. Elon, take the wheel.